Gardening has always been an activity that includes experimenting. And that is what I regularly do at my garden. The advent of internet gives people freedom to do and share things they do, and in the process others also learn a lot. Some time back, while browsing a social networking site, Pinterest, I came across a "pin", as they call it. The site (survivallife.com) had demonstrated growing of potatoes in a small area. The main thing that appealed to me about this technique was the fact that the potato plant (actually it's a vine), didn't need any land to grow those potatoes, all it needed was some wood planks, some soil, and some DIY to be done to grow potatoes vertically. I quite liked the idea, as it was what someone like me needed to grow some veggies, and one like potato, it was just a marvellous idea, and so I decided to give it a try on my own. Here's the pin if you'd like to take a look at this brilliant idea. Though, they claim this technique can produce 100 pounds of potatoes in just 4 square feet of area, I really have no way to check it out, but, I do believe that. I've tried replicating the same, though, not exactly the way they've instructed, but, just tried with a workable solution. 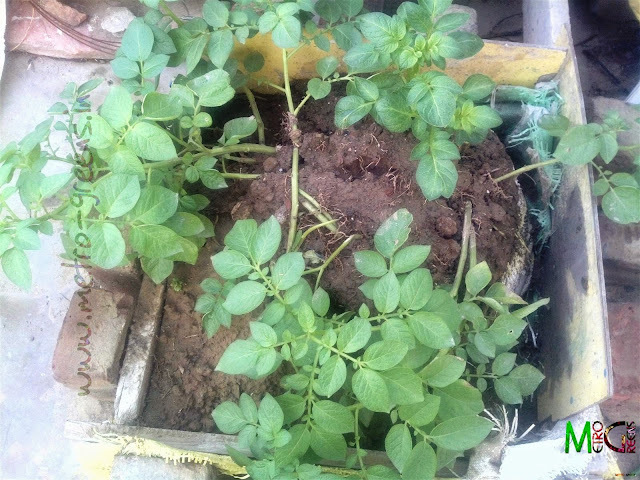 The main idea in this technique is to bury the stems of the potato vine in the soil, so that the nodes on it could bear potatoes, and those potatoes get the nutrients and safety from the soil to grow. So, here's my small potato growing area. For now, I'll need to get more and more soil and bury the stems in the soil to let them produce potatoes, and also will try creating a box like structure to support the soil, the potato vines and the potatoes in it. 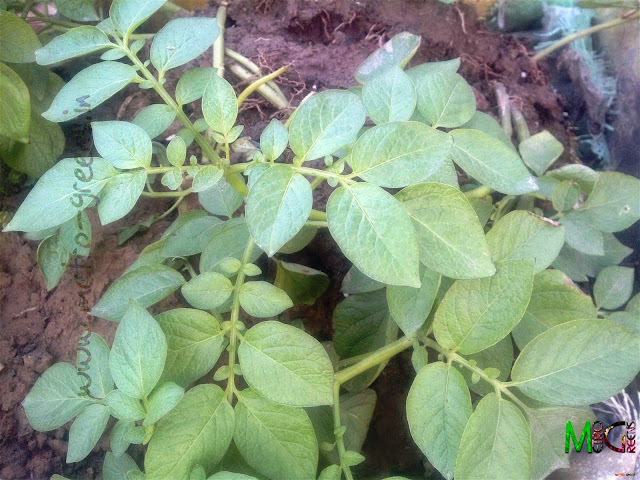 The good thing about potatoes is they are almost inexpensive to procure the plants of, and you can grow them pretty easily, and don't even need to worry about the growing season as the potatoes that we get as vegetables do show up the sowing time automatically, around advent of sowing season. There are small sprouts from the potato, which are supposed to be removed from the potato, along with a bit of the potato, and then are required to be sown in soil. Once in soil, the roots develop and the sprouts develop stems and leaves as well, which as it develops, grows potatoes in the roots. Once the plant has developed enough potatoes and these are ready to be harvested, the plant automatically yellows and dies, letting us know that the potatoes are ready to be harvested. Lets see what happens after the plants give up in a couple of weeks. I will share with you whatever produce I get from this. I'll be back with some more blooms from this year's winters before it goes. Till then, keep experimenting and HAPPY GARDENING. I never tried growing a potato. I will have to try it out i guess!